Dr. Tundup Tsewang receiving Dr. B.R Ambedkar 2019 award. Commemorating Dr. Bhim Rao Ambedkar on his 128th birth anniversary, the principles propagated by Father of the Indian constitution was highlighted by all the speakers on April 14 at Pologround, Leh. Dr. Tundup Tsewang, Former President Ladakh Buddhist Association was awarded Dr. Bhim Rao Ambedkar award 2019 for his selfless effort and contribution for the welfare of the society. 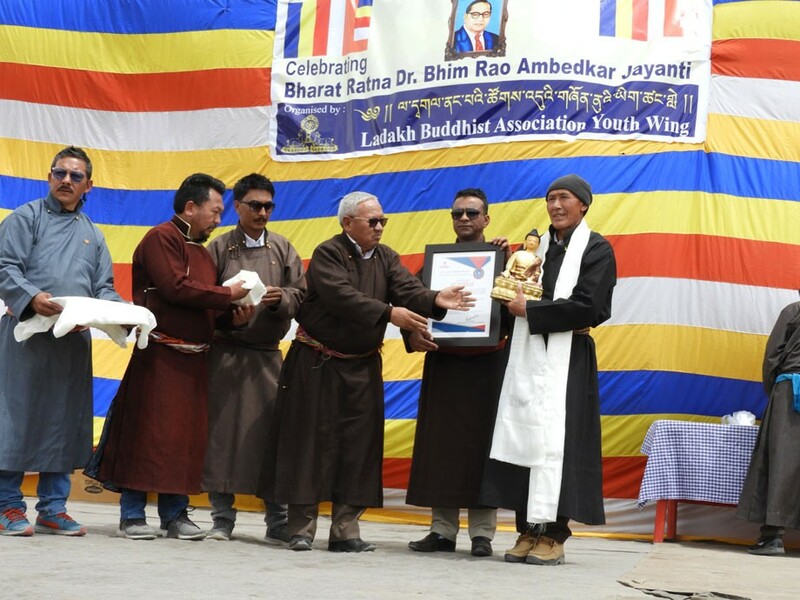 The celebration was organised by Ladakh Buddhist Association Youth wing and Padmashree awardee, Dr. Tsering Nurboo, Physician specialist was chief guest. Remembering Dr. Bhim Rao Ambedkar quote, “Life should be good rather than long”, Dr. Nurboo said that the day will be celebrated at the best if we get inspired and follow his life principles. He said, “Bharat Ratna Babasaheb Dr. Bhim Rao Ambedkar’s life is an inspiration to all of us. His work for caste annihilation, upliftment of downtrodden sections of Indian society, and the idea of freedom and equality inserted in the constitution through various provisions benefited the masses tremendously”. “Dr. Ambedkar is a visionary leader and his contribution towards making India a better society to live is worth mentioning. TheThe best tribute to this legend is only by imbibing his values and ideas in our life and implementing it for a positive change”, he added. He also asked students to inculcate reading habits which is lacking in children nowadays. Students from different schools participated in a mass essay writing competition in Bhoti language. The result will be declared during the ‘Buddha Purnima’ celebration. He also talked about the recognition of Bhoti language in the 8th schedule of the Indian constitution. Ven. Shedup Chamba, President, Ladakh Gonpa Association and Tsewang Thinles, President, LBA also spoke on the occasion. Representatives from different religious organisations, students from different schools and many other dignitaries were also present.